I had a pretty darn good one, headed off to Riebeek Kasteel for lunch with the family, settling down at Bar Bar Black Sheep for a rather lovely fillet poivre, plus a good deal of teasing and laughter. To make the most of the hour or so drive we deliberately arrived early – albeit a verbal punch-up when navigator hubby had us miss our turnoff – and had a bit of a stroll in the warmth of the sun. For those of you lucky enough to visit this little gem of a place, you’ll know you need to allocate about 15 minutes max for a walk through of the main restaurant/shopping area, bearing in mind dawdling and moving from shop to shop will ramp the time up a bit. As a tip, if you’re not going for lunch, the Royal Hotel is a nice place to sit for tea or a nice long alcoholic beverage on the verandah/stoep while watching the dorp go by. After a bit of shop dawdling we drifted over to several estate agents, “just to see the property prices” and my husband did his normal, “you couldn’t live in a place like this, but I could” mantra. The romantic in me sees the quaint, calm, idyllic life we could have there. A large property, big house, plenty of grass, no need to get up before nine and then only to throw open the windows and listen to the chirruping of the birds. 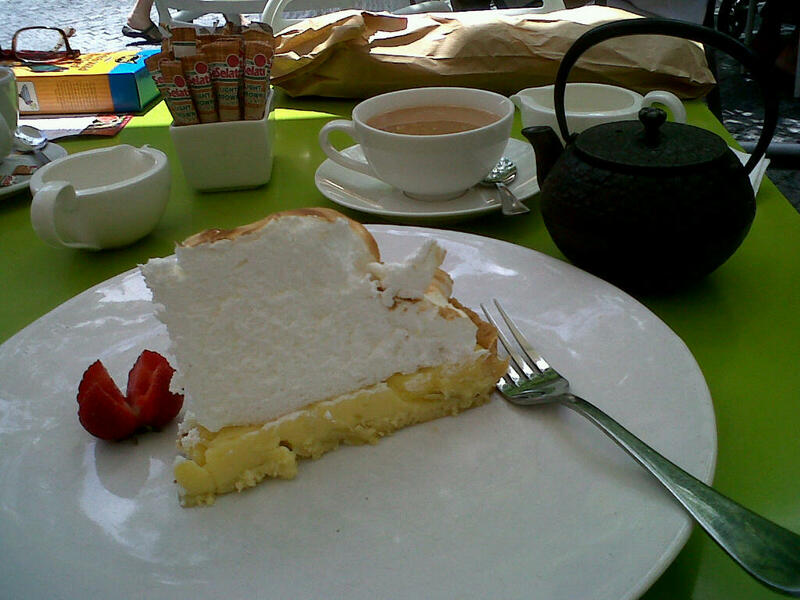 That lemon meringue looks delicious! It appears the lemon meringue alone was worth the trip! That sounds positively lovely. We ran errands and spent yesterday in the park with some of my husband’s coworkers. It was lovely. always so good to hear when people are out and about. One of my favourite things is to see families out doing things, in the forest walking, cycling or on the beach. gosh not been to GB for yonks!